Tumbled Millie Grey Limestone is now available from stock at Stone Vale. We have chosen to tumble this limestone and specified for the stone to be cut into 500mm widths and free lengths. This means that each tile can vary in length from approximately 500mm to 900mm. The flooring should be installed in a random brick pattern. 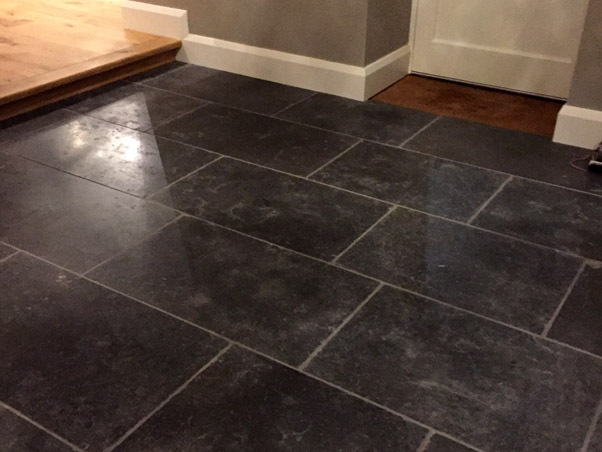 The colour of the limestone is charcoal grey and varies only slightly in shade. This creates an attractive natural look which complements the tumbled surface and edges. There is also some subtle character with lighter coloured shells being visible in some of the stones. Please feel free to call or email if you have any queries at all. Please also order a sample online or call us to discuss your requirements.